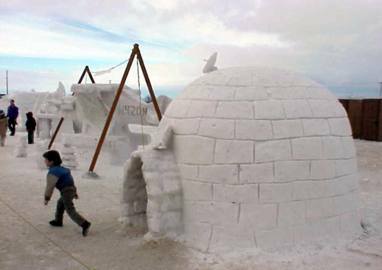 An overcast sky adds to the otherworldly effect of this snow sculpture at the 1999 Fur Rendezvous. If you're looking for an igloo . 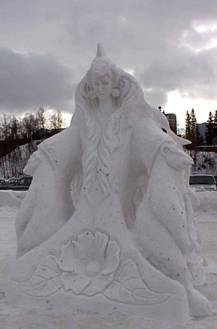 . .
About the only place in Alaska where you're likely to find one is at the Fur Rendezvous' snow sculpture contest. As the running child suggests, even for Alaskans nowadays an igloo is no place like home. This one, at least, is fully equipped if that satellite dish on the roof is any indication. 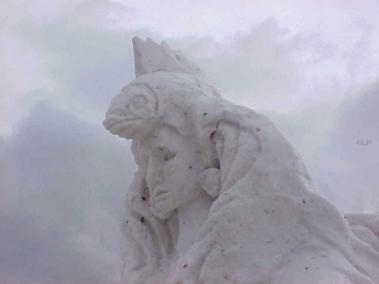 The 1999 event was the 15th annual Snow Sculpture Competition. As in previous years, the weather provides much of the drama in this event. Warm temperatures early in the week of Feb. 14 left the penguin, for example, half melted in the driver's seat. Who would have thought he would have needed air conditioning? At right is another view of the sculpture shown at the top of the page. Polar bears are popular subjects for snow art, as this sculpture reveals, even though the closest polar bears are hundreds of miles away from Anchorage, on Alaska's north slope. They've been portrayed in the winter carnival's snow sculptures doing everything from tipping outhouses to playing pool. This sculpture treats them more respectfully. To make lodging reservations in Anchorage for next year's Fur Rondy.